Michael Davidson (1950-2015) dedicated his scientific career to 3 major avenues – mentoring young students and instilling a strong work ethic in them, developing educational resources for microscopy, and building new fluorescent protein tools for the scientific community. Davidson took the fluorescent proteins originally developed by Roger Tsien, a frequent collaborator, and expanded on then to revolutionize the study of cell biology. In 2014, Mike Davidson deposited his plasmid tools with Addgene. A comprehensive list of cell markers all tagged with mEmerald. Over 300 empty backbones with 100+ distinct fluorophores to chose from in the green, red, yellow, cyan, blue, and orange spectra. Plasmids to monitor protein-protein interactions through multicolor labeling and FRET. This post will discuss the first three categories in detail, but you can find out more about biosensors here. 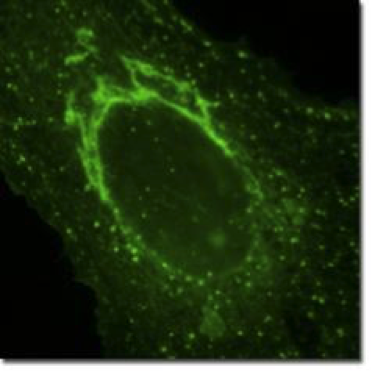 Fluorescent tags can be used to monitor protein localization, interactions, and translocation. They can also be used to measure relative expression levels by comparing fluorescence intensity to that of other known factors. If you are a novice in microscopy techniques or are in need of a visual representation of various cell components for educational purposes, the comprehensive mEmerald-tagged collection is your best friend. 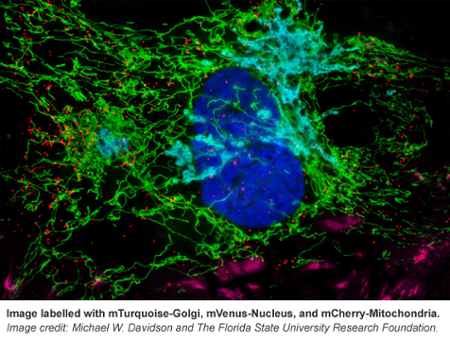 From F-Actin to mitochondria, from the nucleus to cell membrane, this collection has fluorescently tagged versions of many proteins known to localize to specific cellular structures. The Davidson lab even included some of their own reference images that can be found on the corresponding plasmid pages (e.g. see Supplemental Documents here). If you’re not sure where your protein of interest localizes in the cell, use these markers as your guide. Ensure your cDNA of interest and the fluorescent tag are co-expressed properly: double check the DNA sequence to make sure that they are in the same reading frame and there are no accidental stop codons between them. Since the fluorescent proteins are relatively large, it is recommended that you include a ~7-9 amino acid glycine and proline linker between the fluorescent protein and your protein of interest. This should allow for proper folding of the fluorophore and your protein of interest. Test N and C-terminal tags. Tagging the N or the C terminus of your protein of interest with a fluorescent protein may affect its function or localization, so you may need to experiment with both. Luckily most of the Davidson backbones come with both options, having a convenient MCS (multiple cloning sites) on either side of the fluorophores. (Ex. mApple-C1 and mApple-N1). Consider whether you are planning on expressing multiple fluorescently tagged proteins and visualizing them in the same cell. To do so you will need to make sure that the assortment of fluorescent proteins (from different backbones) have sufficiently different excitation and emission spectra for them to be imaged in distinct fluorescent channels on the microscope. Read more about multicolor imaging. In addition, be sure to review the pitfalls of fluorescent protein fusions in blog posts from Joachim Goedhart and Erik Snapp. The Davidson collection is an important tool for studying protein protein interactions within the cell. Many of the fluorescent proteins within the collection are spectrally distinct enough to be used to observe separate proteins in the same experiment. Observing colocalization of two differentially labeled proteins, a scientist can analyze correlation coefficients to determine whether the spatial overlap is a result of co-occurrence or correlation; where the former is due to two (possibly unrelated) fluorophores occupying the same pixel, and the latter indicates a more significant statistical relationship between the fluorophores suggesting biological interaction (Dunn et al 2011). This can be accomplished in live cells or via traditional fixing and immunohistochemistry methods. Another popular and widely used approach to study protein-protein interaction using fluorescent proteins is FRET, Förster or fluorescence resonance energy transfer. In FRET, the energy relaxation of an excited donor fluorescent protein is emitted through non-radiative transfer to a nearby acceptor molecule instead of being emitted as light. The energy transfer is limited to distances less than 10 nanometers and the efficiency of transfer is inversely proportional to the sixth power of the distance between donor and acceptor - only really closely interacting proteins should generate a FRET signal. Due to the sensitivity and distance requirements for FRET to occur, this technique can be helpful in determining whether two proteins interact directly or are simply in the same vicinity. The Davidson lab has deposited several ready to use FRET constructs to speed up your protein protein interaction studies. I invite you to browse and utilize this great collection for your current and future cell biology studies, it has everything you need to get going - markers for specific cellular structures, backbones for easy fusion protein generation, and a spectrum of colors for multicolor imaging. If you use plasmids from this collection to create your own fluorescent protein fusions, we encourage you to deposit them back with Addgene and thereby expand the repertoire of fluorescent protein tools available to your colleagues. 1. Dunn, Kenneth W., Malgorzata M. Kamocka, and John H. McDonald. "A practical guide to evaluating colocalization in biological microscopy." American Journal of Physiology-Cell Physiology 300.4 (2011): C723-C742. PubMed PMID: 21209361. PubMed Central PMCID: PMC3074624.